Hello! It's time for another Corrosive Challenge! I'm afraid I've left my project to the absolute last minute so I am going to keep my post brief lest I fall asleep at the keyboard! 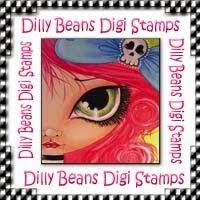 Our sponsor this fortnight is Dilly Beans Stamps! Megan Suarez is the owner and artist behind these fun and quirky images. She has generously offered 3 images of choice for our winner this month as well as generously provided the design team with images to work with. She has an amazing variety of cute & creepy, whimsical images so head over to her shop to check them out! You can find them over on Facebook too! Click HERE to join the group! Our challenge this time around is "Head Gear"! By that we mean anything you put on your head! Hats, barrettes, bows, flowers... If your image has something on its noggin, you're in! Or think outside the box and WOW us with your creativity! The image I chose to work with is called Day of the Dead Frida. I do love these big eye art gals! She is colored with Copics and fussy cut then matted on the Fleur de Lis Nestabilities from Spellbinders. I added mulberry paper flowers to her hair. The image has flowers drawn there but I thought it would be fun to give a little dimension. 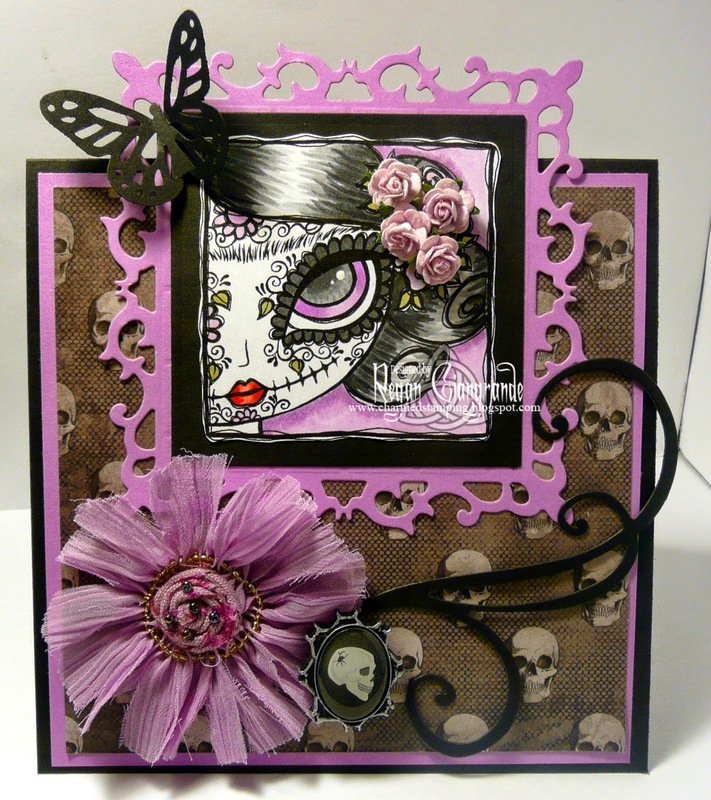 I added a tulle flower, a skull bottle cap, a Magnolia Doohickey flourish and a Martha Stewart punched butterfly. Paper is from the Midnight Magic stack from Recollections. Pop over to The Corrosive Challenge blog to see what the rest of the has under their hats for you! Thanks for stopping by! Markers used: Copics (N0, N2, N4, N6, N8, V04, V12, V15, YG93, R24, R27, R29). Regan, I love your card! I dedicated my card to Linda too. It is so sad! She always encouraged us! As for your card, I love how you embellished her hair with flowers! It looks awesome! wow regan! your card is just lovely! the color-combo and the image is both amazing! i'm sad about your friend linda, i send you an extra hug for your loss. / tess. Love the card. Sorry to hear about Linda. Your card is so gorgeous I love the colours you have used. Way to use your favorite color purple! It rocks and looks so amazing with your stunningly colored image. 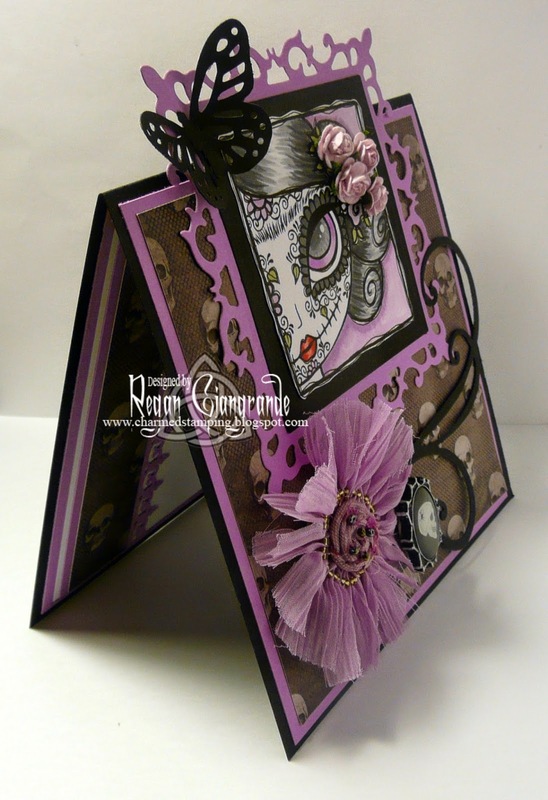 Beautiful layout too :)Thank-you for joining us at the CardsGaloreEncore Favorite Color Challenge #4. Stunning card Regan! I love the flowers, especially the big one!! So sorry to hear of your sad news. Your card is fantastic, love the colours and image. Thanks so much for entering the Crafty Girls Challenge - Good Luck! 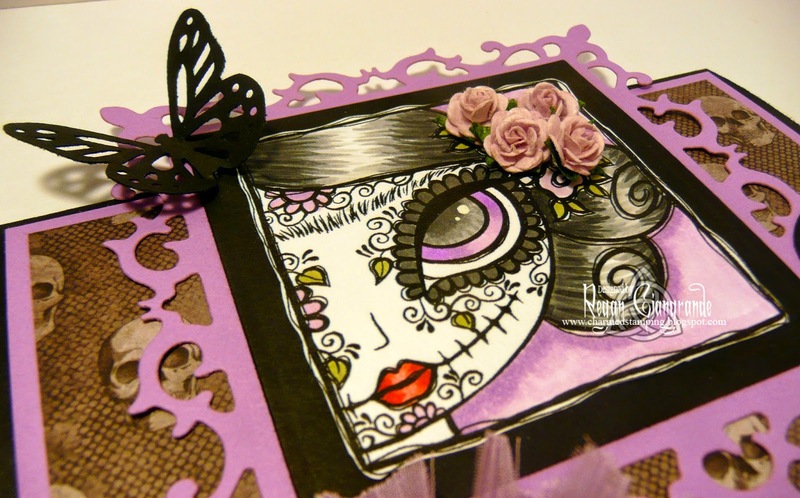 Hi, I love your card and a Fab layout and those colours are Beautiful. Sorry to here about your crafty friend passing away. Thankyou for playing along at That Craft Place. Good Luck and hope to see you again soon.